Baked Feta - What the Forks for Dinner? 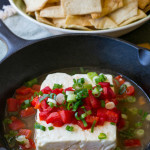 Baked Feta - What the Forks for Dinner? Place oregano, celery, carrots, onions, lemon zest, salt to taste, and 3 cups water into a large pot and bring to a boil. Reduce heat and simmer for 30 minutes. Remove from heat, cover, and let steep for 15 minutes. Strain broth through a fine-mesh sieve into measuring cup, discarding solids. Keep broth warm. For the baked feta: Preheat the oven to 400°. Place the feta in a small ovenproof nonstick skillet( I used a cast iron skillet) and top with roasted red peppers. Pour just enough of reserved broth around the feta to cover the bottom of the skillet. Bake until softened, 8–10 minutes. Garnish with green onions and serve with pita chips.